The users just can’t have enough of budget and mid-ranged smartphone models, and thus, the mobile phone makers also never tire of launching new handsets in the market. In keeping with the trend of frequent model launches, South Korean tech giant LG has recently launched two new smartphone models in the vast and ever expanding mobile market of India. These are the new LG K10 and the new LG K7, and both of these models have come as replacement of the aging L series of handsets. With the K10 and K7, LG aims to offer some great looks and good features at an affordable price. While the LG K10 is more premium among the two offering better capabilities, the LG K7 comes with a more attractive pricing. If, you are considering buying one of these two new smartphone models from the house of LG, but are confused about which one is a better choice, then take a look at the comparison between the LG K10 and its smaller sibling LG K7 to find out which one is the pick for you. The LG K10 and the LG K7 both come with great alluring design language. The smartphone models flaunt sleek, light and very stylish looks with curved glass which offer then a premium appeal. The back panel of the smartphones are also nicely textured which add to their aesthetics and also offer good grip and daily handling. These two new smartphones should certainly find takers just for their good looks. The LG K10 comes packed with a 5.3 inch IPS High Definition LCD screen with a resolution of 1280 x 720 pixels and a resultant pixel density of 277 ppi. Although the screen is very nice, crisp clear and a well detailed, it is a lit lesser than its market rivals which offer Full HD display at a lesser price range. The LG K10 gets equipped with a quad core Qualcomm Snapdragon 410 chipset that should be offering smooth and stutter free performance, considering the device gets only an HD resolution display. On the other hand, the LG K7 packs in a 5 inch IPS LCD screen with a mere FWVGA resolution of 854 x 480 pixels. So, it offers a low pixel density of just 196, which is quite surprising considering it is a new-age phone that has a market full of rivals that offer much higher resolution displays at lesser price. Then again, the LG K7 also comes powered by a lower than expected dual core Snapdragon 210 chipset which is pretty low and not offered in the good quality budget offerings any more. Both the LG K10 and the LG K7 run on the Android OS version 5.1 Lollipop. Both the handsets also get LG’s custom User Interface on top of the stock Android Operating System and offer a number of value added features. In this department thus, both the smartphone models are just the same and there is no confusion between the two handsets. However, while both the phones run on the same Android OS topped with the same custom UI, the K10 offers better performance and smoother smartphone experience as compared to the K7, owing to its more powerful processor as well as additional RAM. The K7 with a custom skin is likely to struggle with its low specs. While the K10 is a mid-ranged phone, the K7 is a budget offering, and their different segments mean that they are packed with different features and specs. Thus, these two handsets come packed with different camera specs as well, and in this department the gap is quite big. 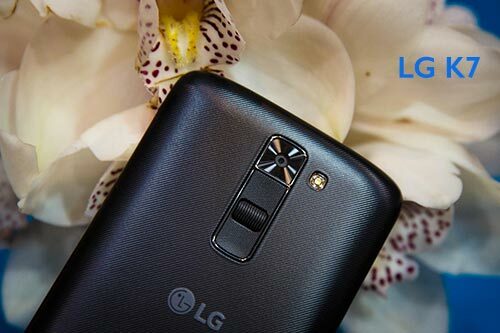 The LG K10 comes with a primary 13 MP camera at its rear, while the K7 offers only a 5 MP rear snapper. Both the primary cameras of these two devices come along with an LED flash. While a 5 MP rear camera might sound very unimpressive, it is quite not the case on the LG K7, as the phone’s rear camera offers pretty good, detailed pictures in well lit environment, while low light pictures using the flash are also decent. Nevertheless, the LG K10’s bigger rear camera certainly offers much better picture quality and photo shooting experience on the whole. When it comes to the secondary front facing snapper, then again, both the models offer exactly same that is a fixed focus 5 MP shooter with nothing different, and this also handles the daily selfie shooting and video chat needs efficiently. The K10 offer 16 GB of internal memory which comes with the flexibility of expandability through a microSD card to up to 32 GB. On the other hand, the LG K10 comes with a low 8 GB of onboard storage which also comes along with a microSD card slot for expanding the memory to up to 32 GB. While the K10 and K7 are priced differently and also come with quite different specs, it is beyond comprehension why LG chose to juice up these two devices with quite similar battery packs. In the department too, both the sibling devices get pretty low capacity battery packs in comparison to the market rivals. While the LG K10 draws its juice from a 2300 mAh battery pack, the LG K7 gets its power from a slightly lesser a 2125 mAh battery. In terms of battery life, the LG K7 offers batter backup than its bigger sibling LG K10, as it gets a lower resolution display as well as lower specs while packing in a similar battery. The LG K10 launched in India as a mid-ranger and is priced at Rs. 13,500. On the other hand, the LG K7 came as a budget offering and launched with a tag of Rs. 9,500. However, both the models are now available for a bit lesser price on various online shopping sites. 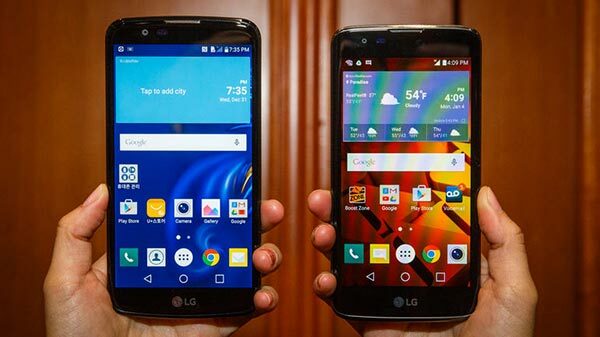 The LG K10 is certainly a better packed device than the LG K7, although there is a good 4 thousand price difference. Nevertheless, there are many capable new smartphone models available in the market that offer better specs and features than both the K10 and K7 at even lesser price range.